The leader of the Indigenous People of Biafra Nnamdi Kanu has made a fresh move against the federal government of Nigeria, NAIJ.com can authoritatively report. Kanu in a petition to the high commissioner of the British High Commission said his trial on treasonable felony is politically orchestrated by the Nigerian government. A source within Kanu’s family told NAIJ.com that the letter dated August 16, and written on behalf of Kanu was sent to the British High Commission on Wednesday, August 17. The source said Kanu is set to send more letters to many other high commissions – a protest on his incarceration by the Nigerian government. “In the face of this conspiratorial plot by the Nigerian government to hang our client at all cost and by any means, we respectfully invite the British government to demonstrate more responsive concern in restoring the dignity and freedom if our client whose fundamental rights as guaranteed under the supreme laws of the land and relevant international conventions has been grossly violated by Nigerian government,” it said. Kanu accused the Nigerian government of frustrating his defence in various ways including the difficulty in accessing records of ruling and orders made by the court during the course of his trial, lack of fair hearing in his matter and the use of facial masks behind screen for witnesses to be brought in by the prosecutor, the Department of State Services (DSS). Kanu in the letter said he has further appealed to the Court of Appeal to set aside the order made by Justice John Tsoho of the Federal High Court. “To set in motion, the expeditious hearing of this appeal, we filed a motion for accelerated hearing of the appeal and all processes so far filled in this appeal were duly served on the prosecution, yet there is no single process filed by the prosecution in response to our appeal,” Kanu stated. He also decried the adjournment of his appeal at the Court of Appeal to March 6, 2017. “Upon being informed of this date of adjournment, we promptly protested and consequently filed a complaint before the deputy chief registrar of the Court of Appeal Abuja division. In the aforesaid letter we carefully provided legal basis for the date to be adjusted backward in line with the requirement of the fast track rules,” he said. The leader of the IPOB further said he is convinced beyond doubt that the “far distance” date given by the Court of Appeal is an effort by the Nigerian government to pave way for the lower court to proceed with its planned secret trial for him (Kanu). Against the order given by Justice Adeniyi Ademola of the Federal High Court for the unconditional release of his (Kanu) is yet to be obeyed, Kanu said that some members of the IPOB across the south eastern region are being held and detained by various security agencies in Nigeria. The letter urged the British authority to note that Kanu was arrested on October 14, 2015, and has since remained under detention on various “phantom” allegations including treasonable felony – in contempt of court orders. “It is more worrisome when the court of first instance, he was originally arraigned on these cooked up charges had discharged and acquitted him of the crime, still the federal government is holding him clear breach of these positive orders of the court,” Kanu said. He called on the attorney general of the federation to demonstrate absolute respect and obedience to the rule of law by directing the unconditional release of the IPOB leader, in total compliance with subsisting orders made by the court. 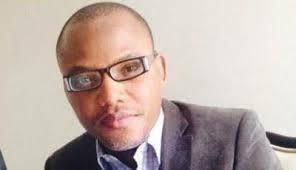 The letter also called for the release of two others – David Nwawuisi and Benjamin Madubugwu – held alongside Kanu. However, on Wednesday, August 17, Kanu also reaffirmed his struggle for the freedom if Biafra and its people. He also he has not and will never renounce Biafra, contrary to indications by the Movement for the Emancipation of Niger Delta (MEND) that he did so in a negotiation with the federal government to secure his release from prison.